By the beach side, Alone with my thoughts. Have you ever had that feeling? Going somewhere quiet and just being alone with your thoughts, staying away from everything and everyone that make your mind run wild? where else can be better than a beach when you want to have a lone time? For many people, the beach is their happy place, because it evokes memories of laughter, joy, and contentment. The beach is my place of relaxation when ever i want to escape from the stress of life and the city noise. 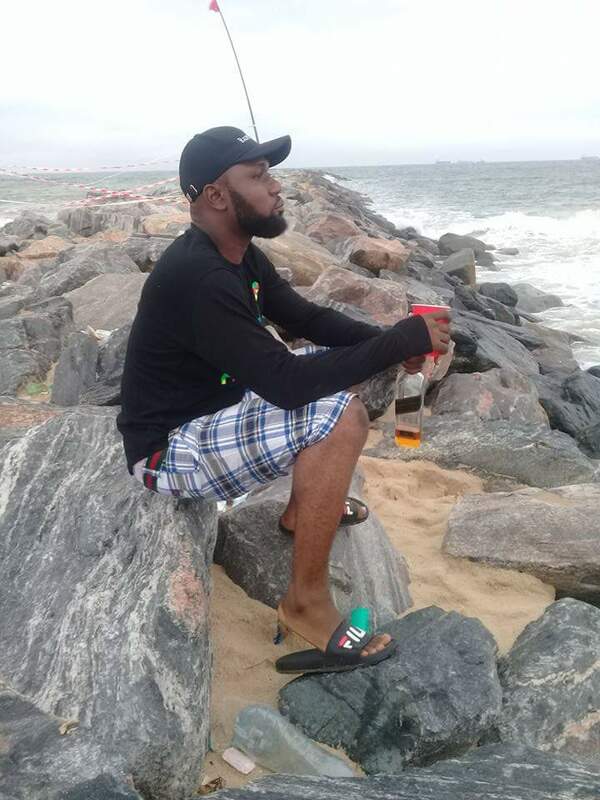 Elegushi beach presents me with the kind of serenity and atmosphere that i need, when am at the beach, i don’t have to think much about life, i just put a pause to some certain things as i sit by the beach side with my drink, my companion for that particular time and stare at the ocean. when i watch the ocean wave, it stirs my heart, inspires my imagination and brings eternal joy to my soul. For those that doesnt know elegushi beach, Elegushi beach is typically a fun zone, situated at the ikate area of lekki in lagos state, the beach harbors exceptional restaurants selling mouth watering and local and continental dishes, night clubs and hangout spots, the beach also plays host to a verity of live shows. Well, this my outing isn’t your normal fun beach culture, where you go for beach party, snorkeling, boating, sailing, or even take beer or snacks with friends, play beach volleyball or beach soccer. i do most of those things at the beach but in this particular occasion the only companion i need is that thing you see me holding, lol. Don’t look at that and think i am an alcoholic because am not, just takes a sip once in a while. When life takes you down to a rough path, just take a walk to the nearest beach. Have you ever heard the wonderful silence, just before the dawn? or the quiet and calm just as the storm ends? or perhaps you know the silence when you don’t have the answer to a question you have been asked, or the hush of a country road at night, or the expected pause of a room full of people when someone is about to speak, or most beautiful of all, the moment after the door closes and you are alone in the whole house? you know, each one is different and all very beautiful if you listen carefully. Sometimes i enjoy being alone because my soul is at peace in the silence. Alone time can always be beneficial! Thank you for sharing! It pays to meditate from time to time. It makes me feel so refreshed and ready for the day ahead! Nice blog! What a beautiful and tranquil place. I love to get to a quiet space and gather my thoughts. Thanks for the read. I love the beach, I love the serenity and the reminder that we are so little and the world is so much bigger than us. I love coming to the beach and just be. Nature is so beautiful, it doesn’t ask us to be perfect, have the best clothing or the best hair, or best of anything. It allows us to just be ourselves. You are right, as beautiful and amazing as nature is, it always allow us to just be ourselves. thank you. Beach is one place i love to hang out, it can be so relaxing and fun at the same time.